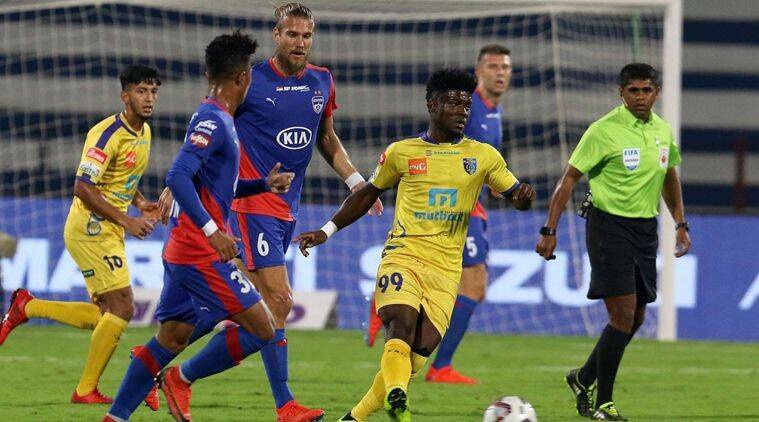 Bengaluru FC staged a superb fightback after being two-goal down to salvage a 2-2 draw against Kerala Blasters FC in an action-packed Indian Super League clash here Wednesday. Slavisa Stojanovic scored a 16th-minute penalty before a fabulous strike from Courage Pekuson handed the visitors a two-goal lead at the break. But just as it seemed that Kerala Blasters may win their first match against Bengaluru FC, a header from Udanta Singh (69th) and another from Sunil Chhetri (85th) helped the Blues grab a point. Kerala threatened from the start and a rampaging run by Mohammad Rakip down the right flank in the 14th minute provided the breakthrough. The young full-back’s cross from the right hit Kean Lewis’ hand and Stojanovic stepped up to convert the resultant penalty-kick to put his team in the lead. Chances were few and far between for Bengaluru. In the 35th minute, Dimas Delgado released Edmund Lalrindika into the box with a perfectly-weighted through-ball but Sandesh Jhingan quickly came across to sweep the ball off the striker’s feet. Kerala’s persistence in attack was rewarded in the 40th minute as Sahal Abdul Samad split the Bengaluru backline with an excellent pass for Seiminlen Doungel. The forward was denied space to shoot but he laid the ball off for an onrushing Courage Pekuson who belted an outstanding strike from outside the box into the top corner of the net. The hosts then upped the ante by playing more balls into the box. Rahul Bheke and Udanta Singh played excellent crosses from the right, both aimed at Chhetri, but the skipper sent his header off target on both instances. Chhetri went close again a few minutes later when he met Dimas Delgado’s cross from the right with a powerful first-time effort. Kerala goalkeeper Dheeraj Singh made a good save to deny the India international and keep Kerala’s two-goal lead intact. Bengaluru finally managed to carve the Kerala defence open in the 69th minute. Chhetri headed Erik Paartalu’s lofted ball back across the box into the path of Udanta Singh who headed home, leaving the defenders rooted to the spot. The hosts equalised with five minutes left on the clock. Udanta received Harmanjot Khabra’s backheel and crossed into the box from the right flank. Chhetri got to the end of it, beating Mohammad Rakip in the air to a powerful header into the net.